Vegan, gluten free and without any refined sugar; these doughnuts actually count as a nourishing snack, filled with high-protein millet flour and healthy fats from coconut! These bites would be perfect for a seasonal gathering, so you can always swap the cocoa powder and chocolate chips for pumpkin spice and chopped apple, gingerbread spice, cinnamon, or cranberries etc. when you’re preparing for a lot of guests…. Add all the doughnut ingredients to a food processor or blender and whizz until everything is very well combined. If it seems a little thick or dry, then add a splash more liquid. Bake for about 12 minutes and then check on the doughnuts, if they’ve risen and are springy to the touch, they’re done. Place them back in if they need to cook more, and check again every few minutes. A toothpick should come out clean when they’re properly baked. Leave to cool for a few minutes in the pan, and then transfer to cool completely on a wire rack. Once the doughnuts are cool, melt a bar of dark chocolate either by using a banemerrie or by placing a pyrex bowl over simmering water and continuously stirring the chocolate as it melts. 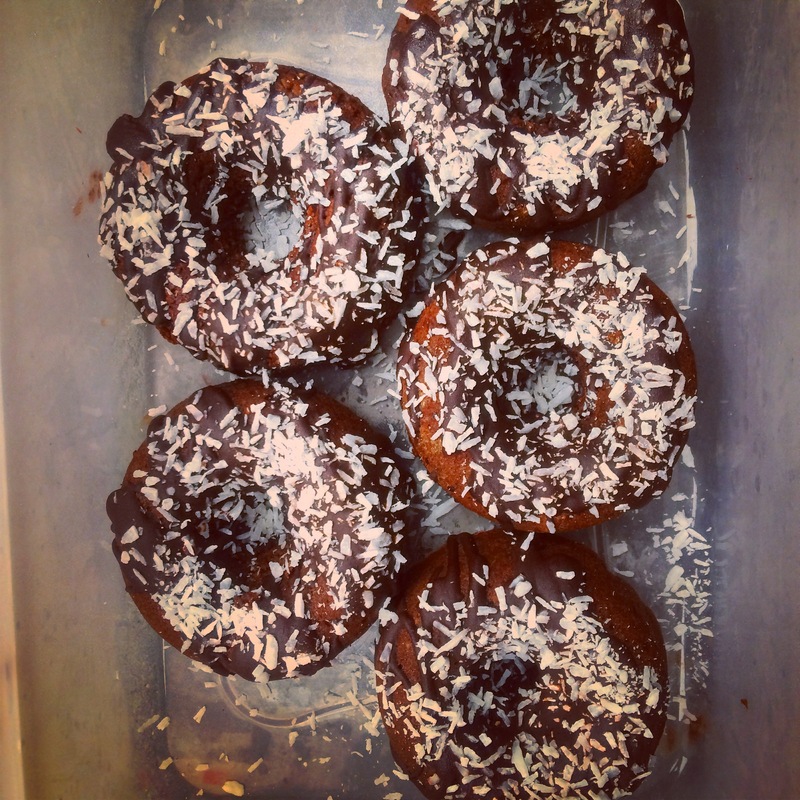 Drizzle the melted chocolate over the doughnuts, and then sprinkle on the coconut before it sets. Leave somewhere cool – preferably the fridge – for a few hours or over night. I have to make them!!!! they look deliciouss, thank you for sharing!